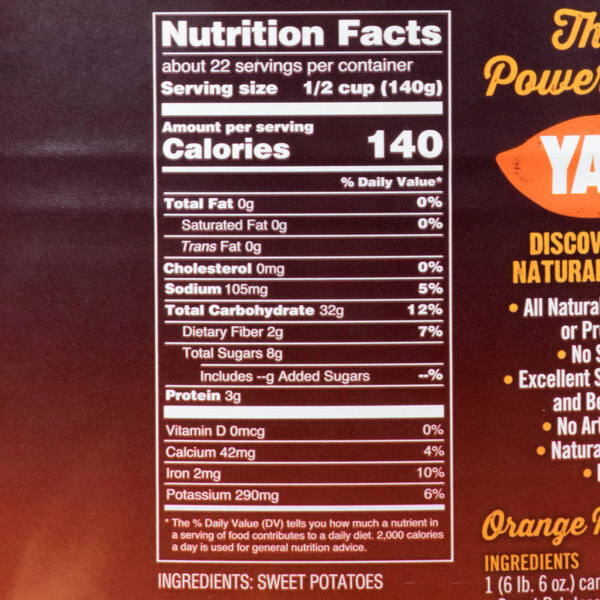 Why does the label on this product say "yam" and "sweet potato"? Isn't there a difference? When sweet potatoes were first introduced in the southern United States several decades ago, producers and shippers wanted to distinguish them from the more traditional white potatoes. To do so, the African word "nyami," referring to the starchy, edible root of the Dioscorea genus of plants, was adopted in its English form, "yam." 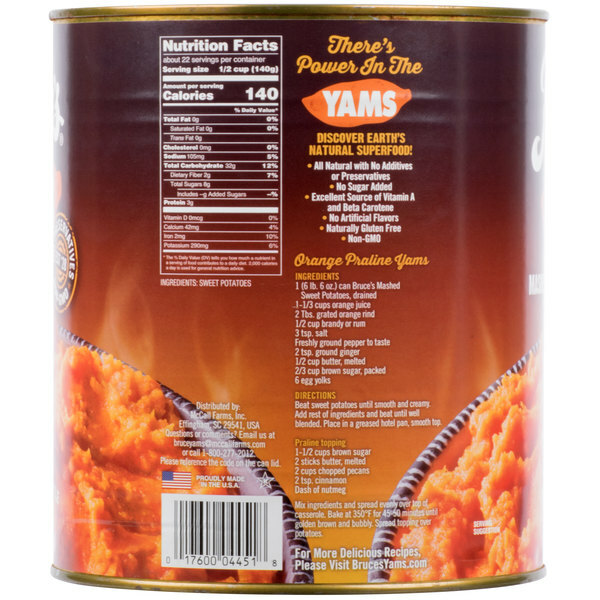 Because yams in the US are actually sweet potatoes, the US Department of Agriculture requires that the label "yam" always be accompanied by "sweet potato" to avoid confusion. Add a flavorful, colorful, and enticing taste to your culinary creations with Bruce's mashed sweet potatoes with no sugar added. The manufacturing process peels the sweet potatoes down to a golden, moist, and uniformly sweet consistency. These no sugar added mashed sweet potatoes are not only nutritious, but their delightfully homemade all-natural taste makes them a must-have ingredient! Offer a taste fresh from the farmer's market with the convenience of canned sweet potatoes. Their unmistakable, hearty flavor is perfect for side dishes, soups, casseroles and pies. Serve these mashed sweet potatoes as a holiday casserole or use them to add additional flavor to pumpkin or squash soup. Try incorporating them in a sweet and spicy southern-style side dish to delight your guests! These appetizing sweet potatoes are sure to give your dishes quality taste with minimal effort. 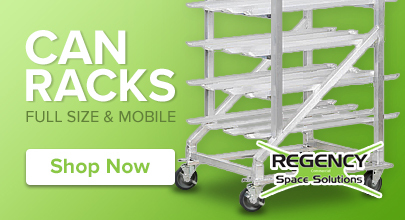 They are ready-to-use right out of the can, making for fast and easy preparation. Simply add to your favorite recipe, bake, cook and enjoy! With their sweetened taste and endless uses, they're sure to satisfy your guests, no matter the occasion! One of the best brands of sweet potatoes i have used. They went great for my event and the guest loved them. They were nice and sweet and cooked up well. I recommend this product. 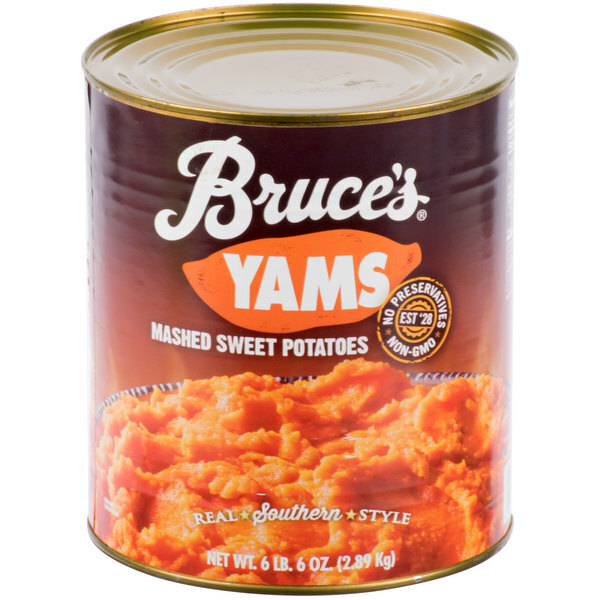 I have been using Bruce's Canned Sweet Potatoes and Yams for nearly 40 years. I cannot imagine trusting my holiday dinners to anything less. This #10 Can is both a great time and money saver. Terrific for sweet potato casserole or many other holiday dishes, you can't go wrong with Bruce's. 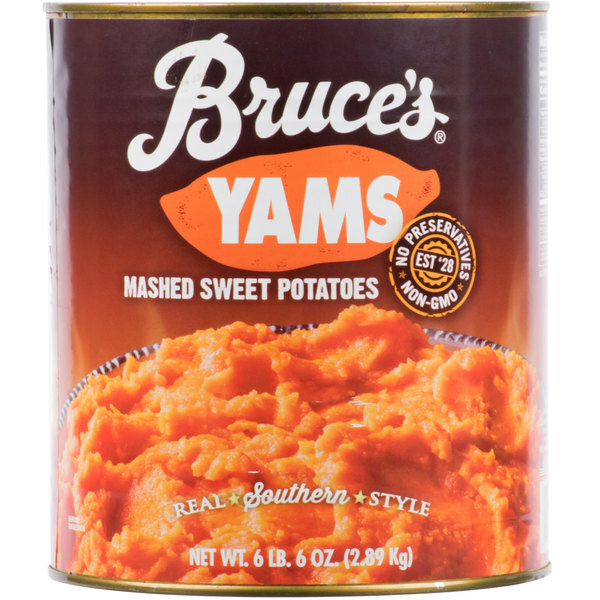 We have to order the 6/pack cases of Bruce's yams because our customer's love it! 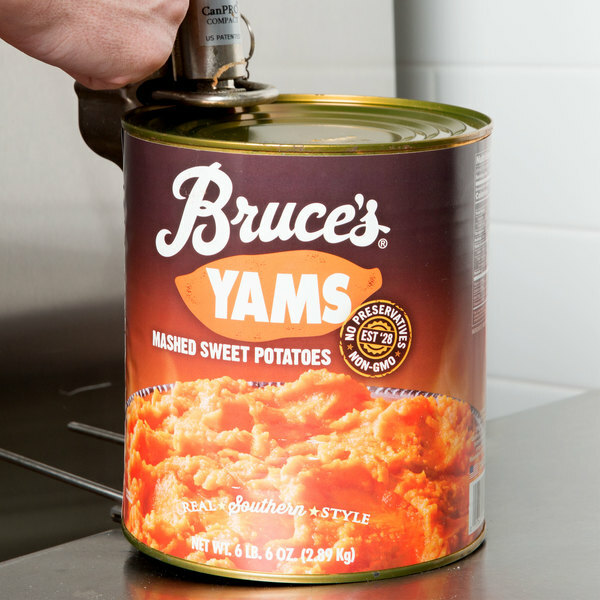 Our favorite part about Bruce's yams? One ingredient: Sweet potatoes. No sugars, artificial flavors or preservatives. Highly recommend! I love these large 10 pound cans. Very economical but you should definitely use hand held can opener if you don't want to make a mess. These are just like the small cans of bruce's yams. A wonderful quality brand that produces deliciously flavored mashed sweet potatoes that are great for our cafeteria. The potatoes are soft and great for all the patience to enjoy. A nice brand with some great tasting mashed sweet potatoes. These are great for using in casseroles and making sweet potatoes pies. They really help speed up the prep process. Sweet on their own naturally, no need for added sugar even plain or with cinnamon these taste great! They are good for side dishes or can substitute in pumpkin pies or use for other recipes. If added to muffins, you can cut back on the sugar and fat content and make them moist, creamy, and healthier using these instead. Bruce's sweet potatoes are also filled with vitamins, notably vitamin A! These mashed style sweet potatoes are good tasting and convenient to have around. Canned food like this makes me lazy. It though wouldn't be worth it if it they didn't have good taste. I got these Because I like Sweet Potato Pie. I did something Crazy I had my son Make the pies I had him cream the sugar and eggs and spices Put them in the pie shells for Thanksgiving I never thought about the butter and milk just forgot. They turned out great!! and after I thought the sure were low fat but tasted good. I will buy this again. I came up with a new side which is mashed sweet potatoes and plantain. This prepared pre-mashed product will cut the prep time in half an save costs. We always purchase these for holiday dinners. They make for great candied sweet potatoes with maple syrup, brown sugar, and spices. Definitely saves time over buying fresh and peeling and cutting them. These yams are perfect for casaroles and they can easily be spiced up to your food service needs. Add some brown sugar and maple syrup. You'll find yourself with a product that customers will die for!